Yesterday was hump day. Started out with a yogurt. Then I had some almonds for a midmorning snack. I’ve been pretty hungry lately, and I don’t know why, but the yogurt isn’t keeping me full until lunch anymore. I have been sadly lacking in water consumption. I do have to come up with a plan that will help me remember to drink more water. I’ve read tricks, like drink an 8-ounce glass before each meal, plus one when you rise in the morning and another at bedtime. I am just so OC that I get totally involved at whatever project I’m working on and I forget to get a glass of water now and then. It’s a goal to strive for, because I know I lose more weight on weeks where I drink a sufficient amount. Rick took me out to lunch. I had two coney dogs with cheese and no buns. They were good, plus it’s always nice to take a midday break from my cubicle on a sunny day. Ah, dinner. It was quite disappointing. 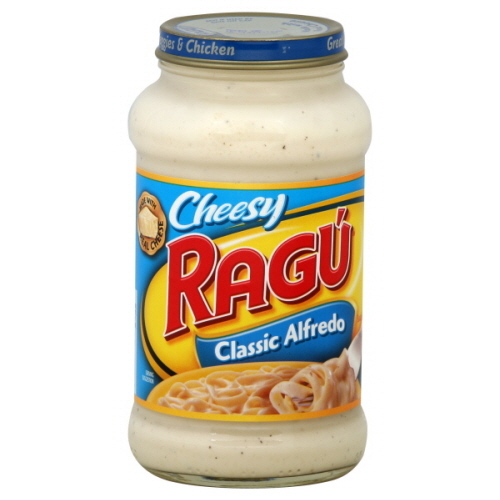 I had leftover spaghetti squash, so I decided to try the new jar of Ragu alfredo sauce in a jar I picked up last week. It’s low carb, and I enjoyed the spaghetti squash alfredo I made at home, so I thought it would be a great option for a night when I was too busy to cook. I was wrong. It tasted like bleck. It had a sort of “processed” taste, chemical-flavored? It was also very bland. 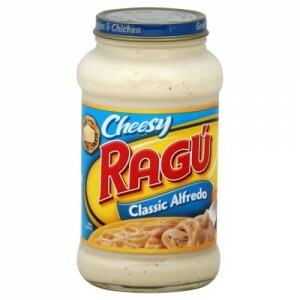 I’m sure I could add some garlic or spices to the remainder of the jar and try again, but the whole meal turned me off. The net result was that I was full, I had eaten under my carb limit, but I was very dissatisfied with the meal. I like spicy food, and it just had no flavor.